Many of your guitar playing mistakes are caused by sloppy technique. Sloppy technique slows down your progress and makes your playing sound bad. To fix sloppy guitar playing, you need to identify what inefficiencies exist in your guitar technique and learn how to practice to fix them. The easy way: Have an expert guitar teacher analyze your guitar technique and tell you what holds your guitar playing back. This is the fastest, easiest and most proven way to reach your musical goals. Analyze your guitar playing yourself (using the steps below). This requires a lot of attention to detail and laser-like focus. Want to learn the best way to improve your guitar technique and speed? Use this guitar speed eGuide to double your guitar speed while cutting your practice time in half. 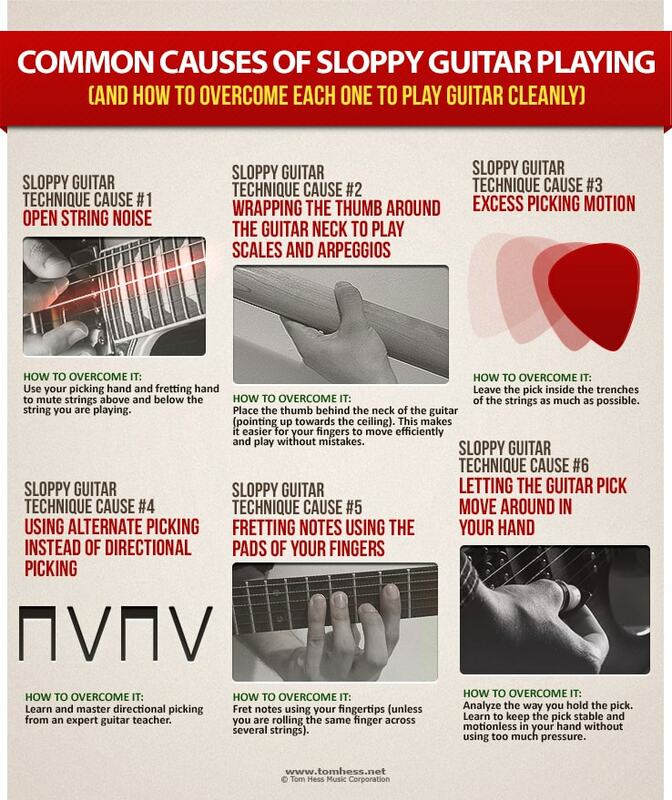 Sloppy guitar playing is often caused by unwanted open string noise. Vibrating open strings make it hard to hear the notes you are actually playing. Heavy distortion (and playing at a loud volume) makes this problem worse. Answer: No! Practice using the tone you want to use in your guitar playing. If you intend to play with distortion, practice with distortion. This makes sloppy string noise easier to hear and easier to correct. More importantly, distortion makes it easy to hear when string noise has been eliminated. Note: Do NOT practice guitar using effects (such as delay, reverb, chorus, etc.). These effects are for playing guitar, not for practicing. Answer: No. Do not make musical compromises to cover up guitar playing limitations. Instead, fix your sloppy guitar technique. Your musical goals should dictate your guitar technique needs, not the other way around. Use your picking hand and fretting hand to clean up sloppy guitar playing. By using the thumb to rest on the lower strings to keep them from ringing. Slide the thumb up and down the lower strings, as the pick plays on the higher strings. This is a very simple and secure way to eliminate string noise. Over time you will develop a thick callus on the side of your thumb (similar to calluses on your fretting hand fingers). Tip: Use a large pick and have more of the pick digging into the string trench (more on this below). This prevents the thumb from muting the string you are attempting to pick. By resting the unused fingers (the ones that aren’t holding the pick) on the higher strings. Tip: Keep your unused picking hand fingers relaxed and mobile. This makes them available for muting string noise no matter what you are playing. If these fingers are tense, relax them before attempting this technique. Your fretting hand technique mutes string noise with the pad of the index finger. The finger pad rests on the higher strings. This gives you an extra layer of security to eliminate string noise. Muting both higher and lower strings makes it easy to only hear the notes you want to hear. This is key to playing guitar cleanly. Wrapping the thumb around the guitar neck forces your fingers to squeeze together. This makes it harder to play guitar fast and clean. Placing the thumb behind the neck of the guitar makes your fingers more relaxed, keeps them closer to the strings and makes stretching easier. This makes your motions more efficient and your playing becomes cleaner. Learn how to improve technique fast and become a clean guitarist. Learn how to quickly master guitar technique with these 11 elements. Practice this fun guitar drill for ten minutes to sound better than ever. Guitar string trench is the space between strings. The more your pick stays inside the trenches of the strings, the easier it is to play cleanly (and fast). The more your pick moves away from the strings, the harder it is to play cleanly (and keep your hands in sync). Thumb muting makes staying inside the string trench very easy. Sliding your thumb up and down the strings keeps the pick in the most efficient position. Note: Avoid pressing the thumb into the strings. The thumb should apply just enough pressure to mute strings, but no more. Pressing the thumb into the strings tenses up your shoulder and creates sloppy noises on string changes. Answer: To skip strings, the pick moves slightly outside the string trench and moves into the next trench as quickly as possible. The goal is to minimize the distance (and time) the pick spends away from the strings. The more your pick stays inside the string trenches, the more efficient (and clean) your playing becomes. Alternate picking forces the pick to move a lot more than necessary. Changing strings with alternate picking requires the pick to leave the string trench, change direction and skip over the string you just played. This makes string noise (and sloppy mistakes) more likely. Directional picking makes your picking motions more efficient and easier to keep clean. It lets you keep the pick in the trenches of the strings, keeps your hands in sync better and prevents sloppy string noise. Answer: Yes, there are. However, this does not mean that alternate picking is a superior technique. It only means that someone mastered alternate picking in spite of its inherent disadvantages. Guitarists who master directional picking play just as fast (or faster) as the best alternate pickers… but they practice a fraction of the time to reach this goal. 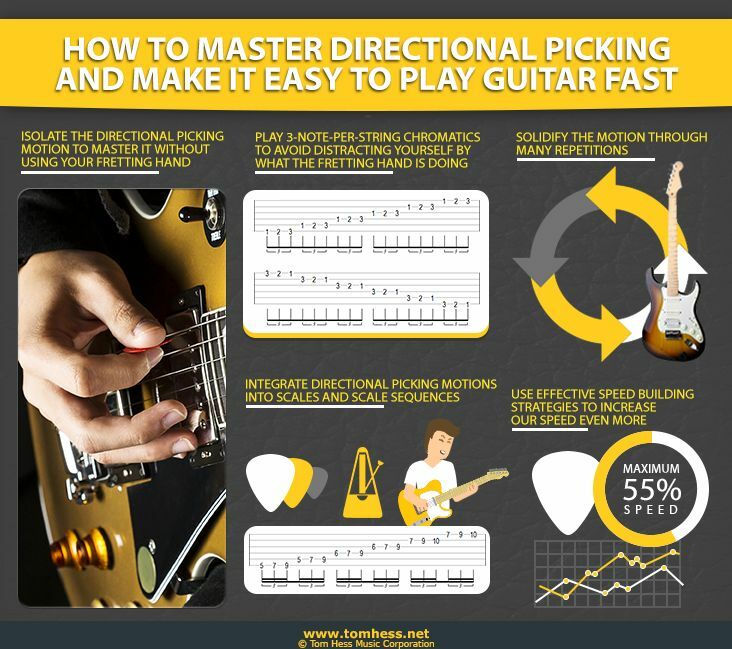 Learn more reasons why directional picking is superior to alternate picking. Fretting notes using the pads of your finger makes your guitar playing sloppy. Finger pads lack calluses, so more pressure is needed to produce a clear note. The pad often doesn't apply enough force to push the string all the way down. When the string is not pushed down all the way, the note becomes muffled and unclear. Using more pressure than necessary also creates extra tension in your body that makes playing guitar difficult. This problem is caused by collapsing the first knuckle of fingers 1 2 and 3, or by extending the pinkie finger too far to fret notes. Solution: Fret notes using your fingertips (unless you are rolling the same finger across several strings). Fingertips have strong calluses and do not compress as easily. This helps you to consistently fret clear notes without excess tension. Fingertips also transfer force to the string much more efficiently. This makes your guitar playing feel easier. Wrapping the thumb around the guitar neck to play scales and arpeggios. Pointing the thumb towards the head of the guitar. Place the thumb behind the guitar neck to improve your hand position and make it easier for the pinkie finger to stretch. Moving the pick around in your fingers makes it hard to articulate the notes clearly and keep your hands in sync. This causes many sloppy mistakes. Solution: Analyze the way you hold the pick. Learn to keep the pick stable and motionless in your hand without using too much pressure. It does not take much force to hold the pick securely in place. Tip: Bringing the pick closer to the wrist joint helps to keep it from moving excessively. Fretting notes far away from the frets requires a lot more pressure to produce a clear note. Many guitarists don’t notice how far their fingers drift away from the frets. This happens most often during fast and challenging playing. Solution: Keep your fingers as close as possible to the fret wire to makes it easy to play guitar clean. Careful attention to details of your guitar technique helps you avoid this problem. Step 1: Record your guitar playing often. Listen carefully to the recording in headphones. The more you focus during this step, the faster your guitar playing improves. Step 2: Identify where your guitar playing is sloppy. Isolate the specific notes that don’t sound the way you want them to sound. Step 3: Determine which elements of sloppy guitar playing are causing your mistakes. Select one guitar technique element to pay attention to. Make adjustments in your guitar technique to refine that element. Listen to how your playing changes as a result. If you notice an improvement, you identified one cause of your sloppy guitar playing. Repeat the process for other guitar technique elements described in this article. Step 4: Refine the guitar technique elements that cause your sloppy playing. Focus on them like a laser until they are mastered. Use this process regularly to develop flawless guitar technique and play guitar clean. Now that you know how to clean up sloppy guitar playing, I want to show you how to build lightning fast guitar speed, even if you don’t have much time to practice. Download this free eGuide to learn how to double your guitar speed, so you can play anything you want as fast as you want. Study with the best online guitar teacher to reach your musical goals fast.